Protea Biosciences Group, Inc. (OTCQB:PRGB) and InSphero AG jointly announced today that they have entered into a collaboration that will combine each company’s respective 3D technology. InSphero AG is the leading supplier of 3D organotypic microtissues for in vitro toxicology and efficacy studies, with models derived from liver, pancreas, tumor, and brain tissue that yield a high level of predictability during drug development compared to traditional 2-dimensional cell culture and other in vitro model systems. The collaboration will use Protea’s proprietary LAESI® direct molecular imaging platform to analyze InSphero’s proprietary 3D InSight™ microtissues, creating 3D molecular profiles for tissue characterization, drug metabolism and distribution, pharmacokinetic and toxicity applications. From this collaboration, Protea and InSphero expect to create new products and services that may be marketed to pharmaceutical and biotechnology researchers worldwide. To learn more about InSphero visit www.insphero.com. To learn more about Protea visit www.proteabio.com. About Protea Biosciences Group, Inc.
Protea Biosciences Group, Inc. (OTCQB:PRGB) is a commercial stage molecular information company, focused on meeting the needs of pharmaceutical, biotechnology, agriculture, chemical and other industries with innovative bioanalytical technologies. Protea’s proprietary technology, LAESI® (Laser Ablation Electrospray Ionization), is used with mass spectrometry to identify large numbers of distinct molecules from a single analysis of tissues, cells, fluids, agricultural specimens and other sample types. Using proprietary software (ProteaPlot™), the location of each distinct molecule in a respective sample can be displayed, enabling direct molecular imaging. The LAESI DP-1000, an integrated system that combines LAESI and ProteaPlot, is marketed to a wide array of researchers for numerous applications. Protea maintains its own laboratory facility where it performs services using LAESI and complementary technologies for a wide array of customers to support preclinical pharmaceutical R&D, biomarker discovery and other applications. Protea also collaborates with researchers to apply its technologies and expertise to generate new discoveries and intellectual property. Protea and LAESI are registered trademarks of Protea Biosciences Group, Inc. This press release may contain certain statements relating to future results. These statements are not historical facts, but instead represent only the company’s belief regarding future events, many of which, by their nature, are inherently uncertain and outside of the company’s control. It is possible that the company’s actual results and financial condition may differ, possibly materially, from the anticipated results and financial condition indicated in these forward-looking statements. Further, information concerning the company and its business, including factors that potentially could materially affect the company’s financial results, are contained in the company’s filings with the Securities and Exchange Commission. All forward-looking statements included in this press release are made only as of the date of this press release, and we do not undertake any obligation to publicly update or correct any forward-looking statements to reflect events or circumstances that subsequently occur or of which we hereafter become aware. 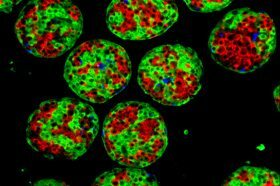 Protea has announced a collaboration to characterize InSphero’s 3D microtissues, such as 3D InSight™ Pancreatic Microislets, pictured here.